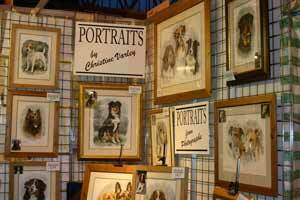 Bring your dogs for a free photo-shoot for a pet portrait at Crufts. Or bring your own photos to discuss your order. If you are making a special journey to the show, please Contact me in advance. Official opening of the Kennel Art Exhibition, London, Christmas 2012. 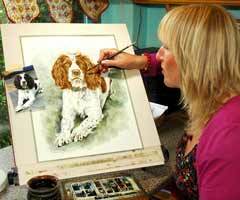 The Exhibition features original paintings from 14 of the top dog artists in the country. 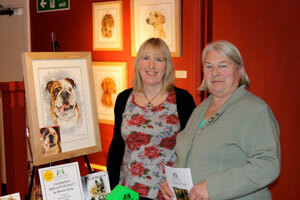 Here is Christine Varley with Pat Sutton of the Kennel Club Gallery board, surrounded by her original paintings, launching the Pet Portrait competition in aid of the Bark and Read charity. 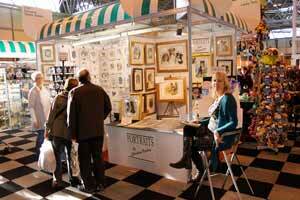 Crufts 2013 was the launch for the new range of dog breed gifts, featuring artwork by Christine Varley. Cards, Keyrings, Mugs, Prints and Canvas Art gifts for dog lovers. The new range can be seen on WaggyDogz. 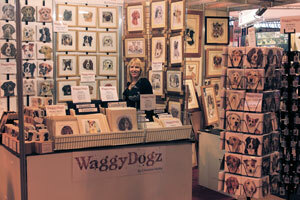 WaggyDogz also accepts trade orders, see WaggyDogz Website for details.